To, who holds 17 Hong Kong records and won a silver medal as part of Australia's 4x100 meter medley relay squad at the 2013 world championships, was in the United States for a three-month training program at the University of Florida. "He felt unwell at a training session and was taken to hospital where sadly, he passed away," the Hong Kong Sports Institute, where To was an Elite Scholarship Athlete since 2016, said in a statement. "He was extremely popular and loved by his team mates and competitors. Kenneth was known as a truly exceptional person, warm, funny and kind. His sudden passing is a huge loss to local sports." 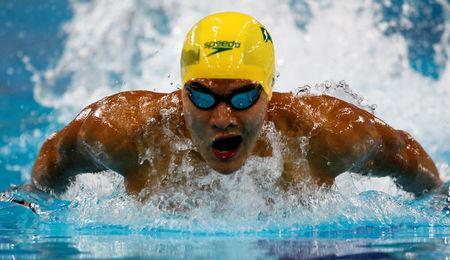 In 2012, To won the men's overall title in the FINA Swimming World Cup, before claiming three medals in the FINA World Swimming Championships in Istanbul. World swimming governing body FINA said in a statement it learned with "immense sadness" about To's death and described him as a reference and example for the youth in the territory. Australian swimmer James Magnussen posted a tribute to To on Instagram https://www.instagram.com/james.magnussen/?hl=en saying: "Shocking news to hear of the passing of my competitor but most of all, friend - @kennethkhto. We've been racing each other and making teams together since we were 16.